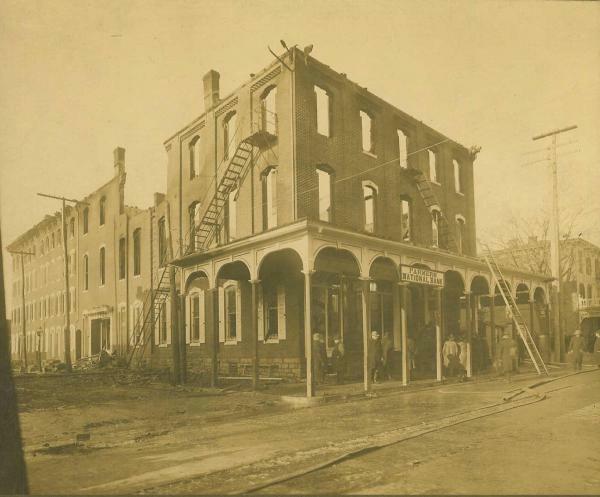 Ruins of the Rhoads Building, Boyertown PA, January 14, 1908. Flip to Interior ruins of the Boyertown Opera House, Boyertown PA, January 14, 1908. After the fire broke out, panicked theater goers were trapped against the doors of the single entrance, which opened inwards. Located outside of elevated windows, the two fire escapes buildings, whose construction had been resisted the by owner, failed to handle the press of people trapped inside. As some people fought to escape, others threw themselves from the second story windows, hoping they might survive. In less than an hour more than 170 were dead.